Ninety percent of the human population, give or take, already regards the automobile as an appliance. At best. 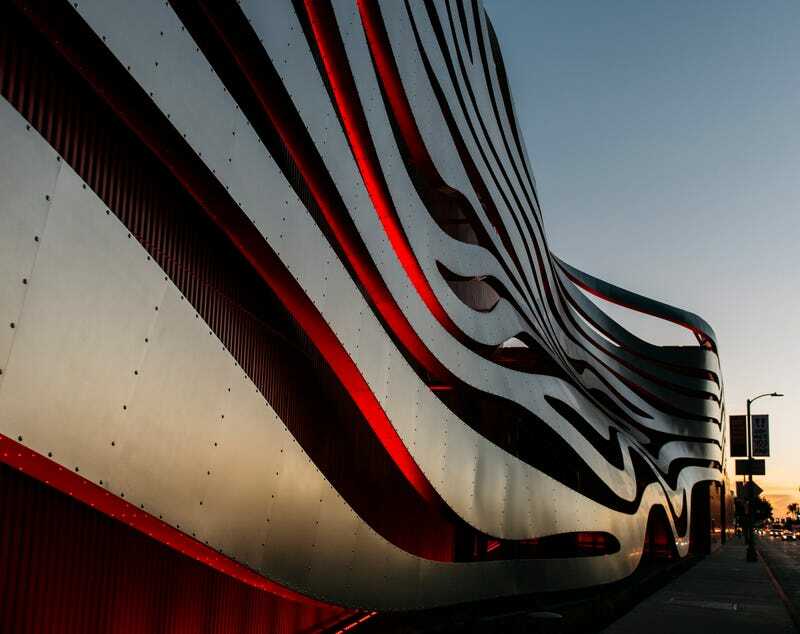 The Petersen Automotive Museum, newly emerged from the most radical of transformations, is the 10 percent showing the 90 percent why it isn’t. Since it closed in October 2014 they said they’d finish this place by early December. And by God, the bastards pulled it off: precious few believed that in 14 months the fine folks of the Petersen Automotive Museum could gut the bones of the Seibu Department Store and kick out the cutesy dioramas and old-timey gas pumps, Pontiac logos, Fifties chrome dreamboats parked in front of a speed shop to the dulcet tones of Buddy Holly and The Big Bopper, a place where The Music Never Died, all yours to behold for $20 a pop. But they did to the tune of $125 million. And they put up 80,000 square feet of red aluminum siding, 866 computer-controlled exterior LED fixtures, 308 segments of aluminum ribbons weighing 100 tons total, rendered in Pantone 187C “Hot Rod Red” paint allegedly inspired by the color of vintage Ferraris—of course!—that took 60 truckloads to haul from Kansas City to Los Angeles and which glow eerily red at night like brains. What we have lost. Fortunately, the The Dog Cafe now resides at a beautiful North Hollywood bar called Idle Hour. All for this, this gleaming cathedral—more art gallery than car museum, containing within double-ended glass doors the whole breathtaking scope of the mechanical world: 100 automobiles, 23 motorcycles, 10 Forza racing simulators, four scooters, two BMW art cars, one bobsled (also by BMW), one $2.5-million Bugatti Veyron L’or Blanc hand-painted by Königliche Porzellan-Manufatur as a one-of-one limited edition (but by the end of production what Veyron wasn’t)—and one full-sized model of Lightning McQueen in the Pixar Cars Mechanical Institute. Top to bottom: a BMW 3.0 CSL art car by Alexander Calder; the $2.5-million Bugatti L’or Blanc; Chairman of the Board Peter Mullin cuts the ribbon. All art and beauty and majesty assembled possibly for the last time ever. Because the human-operated, gasoline-powered motor carriage could very well be a dying form—a last gasp of relevancy before the Teslas and Apples and Ubers of the world disrupt our daily commutes, as if the legislators and EU regulations hadn’t continuously conspired to turn our modern machinery into armored, androgynous, autonomous plastic blobs for the past twenty years. As even Los Angeles moves away from the sordid concept of commuting “culture,” the Petersen may as well someday become a whaling museum or an exhibit on the Gemini missions: a preserver of forgotten forms, an archiver of lost traditions. From the inside out, to the outside drawing inward, this museum must make an impact. To visit the Petersen you drive down Wilshire Boulevard, from downtown, heading west. Past the Latino flea markets by MacArthur Park to Koreatown, past nearly every form of architecture of the 20th century, past Spanish Revival and Modernism to the Art Deco gem of a Staples store (! ), around the corner and all the way to a gleaming pile of aluminum snakes altogether dramatic and sublime and thoroughly ridiculous. A time-lapse video of the Petersen’s construction. Across the street, the Streamline Moderne 1939 May Company Building is being transformed into the Academy Museum of Motion Pictures, receiving a glittering transparent sphere in the process. Next door at LACMA, architect Peter Zumthor is tearing down the 1965-era complex and building an inky black blob that stretches across Wilshire like a wad of spittle. Los Angeles is constantly 10 years away from being truly amazing. The Petersen is only the first effort toward that ideal. By 2023, you should be able to take the Purple Line subway from downtown right to Wilshire and Fairfax, right across the street from the museum, thereby bypassing the bus lanes and bicycles and impossible left turns of Mid City. Imagine taking a subway to visit a car museum. Robert E. Petersen, Chairman of the Board himself, would be apoplectic. Top to bottom: ribbonwork; Porsches in the Nearburg Family Motorsport Gallery; looking up from the bottom of the Grand Staircase. In 2015, I worked at the Petersesn Automotive Museum for seven months. An archivist of lost traditions, a curator of the highest automotive echelons. For seven months during its transformation, what I was. When I left Autoweek in 2014, I left behind a dream job and a wonderful staff of rapscallions—but I also left behind the overhyped press releases, the hollow media trips and the endless braggadocio of consumer journalism. Instead, I became a Curatorial Assistant at the Petersen and joined a team of five. Seven months of jackhammering. Seven months of a dull throb that shook the ground above our heads. Construction crews were drilling holes through three levels of foot-thick concrete in order to build the three-story grand staircase: 67 steps, 21 tons of steel, and 6,400 separate components. A digital countdown by the reception desk silently buzzed down the days until reopening: 192 days, 34 hours, 16 minutes and 58 seconds. It seemed like forever. We kept our morale up by watching Cars, and the Paul Newman documentary Winning (excellent, by the way.) We even held staff cook-offs. Collections Manager Dana Williamson, the chief car wrangler, won three consecutive times. I reported to Leslie Kendall, the Chief Curator, who had been at the Petersen since the beginning, after helming the direction of a smaller car museum in San Diego. He remains one of the sharpest people I ever worked with. No piece of automotive history escaped his grasp. He’s a living, breathing, quick-witted encyclopedia of the arcane. His office featured wall-to-wall bookshelves and stacks of periodicals, from buff books to increasingly forgotten car clubs, hardcover books on every possible marque; he must have absorbed all that information like he was in The Matrix. Perpetually up to his elbows in busywork and phone calls, he always provided a sturdy jumping-off point for research. “Find out as much as you can about the 1881 Ayrton and Perry Electric Tricycle,” he would say. And I’d go on this wild snipe hunt for a fictitious vehicle that I was certain he made up—until I realized that not only did it exist, but a German museum even built a faithful replica of it. Top to bottom: the first CNG-converted car, the Fiat 508 Balilla; the Lifestyle Car Club’s “Sinful Sin” Chevrolet Impala; Doane Spencer’s 1932 Ford Roadster front and center in the Hot Rods & Customs gallery. I charted the locations of every single racetrack in Southern California, from Inyokern to San Diego to Blythe. Current, defunct, and dwindling. From dirt tracks to airport runways to Indy-rivaling velodromes. Did you know that officially sanctioned drag racing first originated in Goleta? Or that 1910s daredevils circled Corona’s perfectly round Grand Boulevard, averaging nearly 75 miles per hour on dirt, essentially keeping their feet to the floorboards? I made a comprehensive spreadsheet of the evolution of custom cars. The aforementioned now jobs, for example, leading into the classically-styled hot rods of the 1930s—down to bosozoku and Stance Nation, why not? Don’t say The House That Pete Built isn’t open to new and diverse ideas—we even exhibited the eye-searingly pink Honda S2000 from 2 Fast 2 Furious at the Reagan National Library, which probably made The Gipper hit 9,000 RPM as VTEC kicked, yo in his tomb. I charted the same evolution for motorsports. From the Pau Grand Prix to the Blue Train Races all the way to the death and life of IMSA. My first week on the job, I made a Skype call to Bologna, Italy at midnight Pacific time to secure the world’s first compressed natural gas car—a 1938 Fiat 508 Balilla. It was outfitted with two giant CNG tanks atop its roof. Still belonged in the family company of its inventor. To my surprise,the Italians said yes. I found a man in Minneapolis who spent three years restoring a 1969 Honda CB750. In his 46-page build thread, he detailed chasing down the exact H-embossed bolts used in the factory during its production period. He hadn’t even gotten a chance to fire up the engine before he shipped it out to Los Angeles. I called a man in Calgary about a Turbonique rocket-powered go-kart. Guaranteed 125mph. Possibly the last one in existence, for obvious reasons. Top to bottom: Honda CB750 on display in the Varner Motorcycle Gallery; McLaren F1; new interactive touchscreens pinpoint exactly when the Malaise Era started. Not many offices boast of a 1913 De Dion-Bouton leaking oil mere feet from your cubicle. But even farther back through sets after sets of steel double doors are where the treasures are: the 300 cars of the Petersen’s permanent collection. Biding their time until the museum reemerged. More than a few times we had to turn people away—they had traveled from Montana or the East Coast and made it a special point to visit. It was always a heartbreaking thing to overhear. Colleague Forest Casey, the consummate professional, the tour guide’s tour guide, almost always made it a point to give them a quick peek around the basement. Sometimes, I joined him. Porschephiles were drawn toward the 356 Continental or the 901 pre-production prototype. The practitioners of irony loved the Mustang II—proudly exhibited at the Muscle Car Cruise-In. (Hell yes.) Nearly everyone ogled the Speed Racer Mach 5 and the Batmobile and the car from Grease. People didn’t fathom how impossibly 1970s the Stutz Bearcat was until they were told that it was first ordered by Evel Knievel, then sold to Elvis, then bought by Wayne Newton. People didn’t appreciate how it was parked next to the most 1980s vehicle ever: the American Express DeLorean, plated in 24-karat gold, a four-wheeled temple to Reaganomics, and its time on display at the Reagan National Library was akin to a homecoming. Open up the Louis Vuitton trunk to Fred Astaire’s 1927 Rolls-Royce Phantom I by Hooper, however, and a shiver goes down the spine of most people. The spats, the cricket bat, the top hat. Looking at the man’s personal belongings was like being close to the man himself. I showed my parents around. They’re not car people, but my father can tell you exactly how heat-treatment and finite element analysis works. Forest spearheaded a project known as “Industry Professionals, consisting of interviews with engineers, designers, marketers, and anyone related to the intricate process of bringing a car to life—and my father, a manufacturing engineering professor, had consulted for the likes of John Deere, Ford, and Pratt & Whitney. So. During one of his visits to Los Angeles, I suggested putting him on camera. The production team asked him what his job was like, what he found fascinating about cars, etc. And for now, anyway, my father is immortalized within the walls of the museum. Top to bottom: Corvette XP-87 Stingray Racer; a pair of Ford GTs; your humble author and his old man. The day before the museum’s unveiling to the media, the crew stayed up until four in the morning awaiting the arrival of Juan Manuel Fangio’s 1954 Mercedes-Benz W196 Streamliner, which now sits in the jewel-like Precious Metals room, an astounding gallery of rarities, all silver in color. How’s it been these last few days? I asked some of the technicians, Brynner and Rob. Just before it was to be delivered from the Indianapolis Motor Speedway’s Hall of Fame Museum, the W196 sustained damage at a show. The famed enthusiasts at Canepa had taken care of the bodywork. Hence, the delay. But the car made it—as did every single car we had pinpointed, marked down, called about, replaced, changed last-minute, swore about, and suggested to a finicky board of directors, all of whom had their own priorities. Top to bottom: Fangio’s fancy Benz W196 Streamliner; the Davis Divan lovingly restored by Indiegogo; checking out the Pontiac Aztek from Breaking Bad, nestled among Hollywood royalty. This is where they simultaneously rest atop gleaming custom platforms while exaggerating the illusion of motion, and their hand-hammered curves will gleam off the LED spotlights—immortal, timeless, fresh-faced, forever alive. All photos by Kevin McCauley, whose last trip to the Petersen resulted in an impromptu rave. Blake Z. Rong is a writer based in Texas. He has contributed to Autoweek Magazine, Jalopnik, and of course, the Petersen Museum.